Names, Heraldic Artists Ltd., 3 Nassau Street, Dublin 2, Ireland. Histories are only in print for the names listed below. 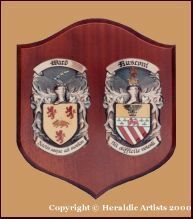 Burke family history & Family Trees of the Burke/Bourke/de Burgh family in Ireland with Articles on the Gibbons, MacSheoinin, Jennings, Philbin and MacMeyler families. 174 pages, illustrated, cardcover, 1995, by Eamonn Burke. 36 pages, illustrated, cardcover, 7th. edition, 1991, by Lord Dunboyne. Dunne family history, 120 pages, illustrated, cardcover, 1996, by Joe Dunne. Kelly, Origin of the Name O'Kelly. O'Kelly family history. 52 pages, cardcover, 1968, by Anthony Mathews. MacCarthy family history, 80 pages, illustrated, cardcover, 1991, by Alicia St Leger. McGuinness, Origin of the Name McGuinness. McGuinness family history. 36 pages, cardcover, 1968 by Anthony Mathews. O'Brien, History of the Name O'Brien. O'Brien family history, 48 pages, illustrated, cardcover, 1977, by J. D. Williams. O'Brien family history, 80 pages, illustrated, cardcover, 2nd ed., 1988, by Hugh Weir. O'Brien, These my Friends & Forebears: The O'Briens of Dromoland. Family history, 272 pages, illustrated, hardback, 1991 , by Grania R. O'Brien. O'Connor, History and Origins of the O'Connors. O'Connor family history. 64 pages, illustrated, cardcover, 1987, by Martin O'Hara. O'Connor family history, 100 pages, illustrated, cardcover, 1994, by Hugh Weir. O'Doherty family history, 126 pages, illustrated, cardcover, 1998, by F. O'Dochartaigh. O'Dubhda Family History. O'Dowda, O'Dowd, O'Dowdy, Dowd, Doody etc. 24 pages, cardcover, 1990, by Conor Mac Hale. O'Flaherty, Origin of the Name O'Flaherty. O'Flaherty family history. 44 pages, cardcover, 1968 by Anthony Mathews. A collection of historical articles relating to the O'Malley's. 96 pages, illustrated, cardcover, 1988 by Sheila Mulloy. O'Neill family history. 72 pages, illustrated, cardcover, 1991, by Seán O'Neill. O'Neill, The O'Neills of Magh dá chonn (County Carlow) & Thomond. O'Neill family history. 190 pages, soft cover binding, 1995, by Seán O'Neill. Heirs and Graces: The Claim to the Dukedom of Leinster. i.e. the Fitzgeralds of Leinster. 164 pages, hardback, 1981, by M. Estorick.